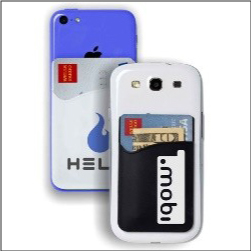 Order custom silicone smart phone card holder pockets to advertise your business, organizations, logo, company, and more. These unique pockets act as a simple wallet that is absolutely convenient for holding a driver’s license, credit cards, business cards, gym and rec cards, cash, hotel keys, casino cards, cruise ship cards, and so much more. Ideal for easy travel and protection of your id’s and card items. Adheres via 3M self stick adhesive.